Last fall, I wrote about the rather remarkable coincidence of the Bradys Feigl. Since then, the doppelgangers have met, and they even took a DNA test to see if they’re related. 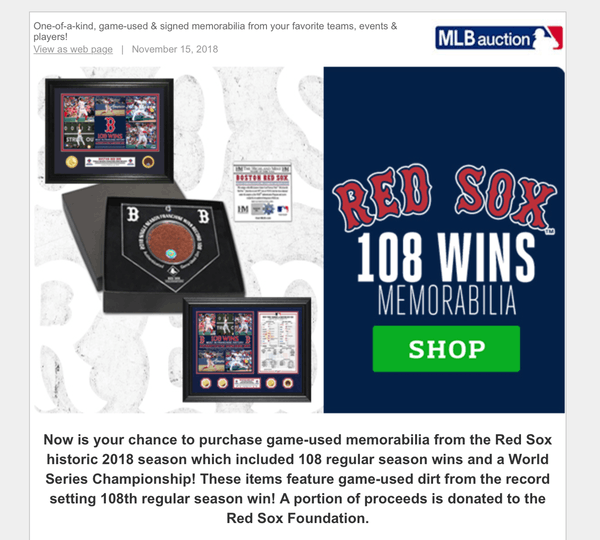 Since the Red Sox won the 2018 World Series, I’ve received a fair number of emails from the team pitching all sorts of swag. This one really made me laugh. First off, as the 2001 Seattle Mariners know, regular season wins don’t mean much once the playoffs start. 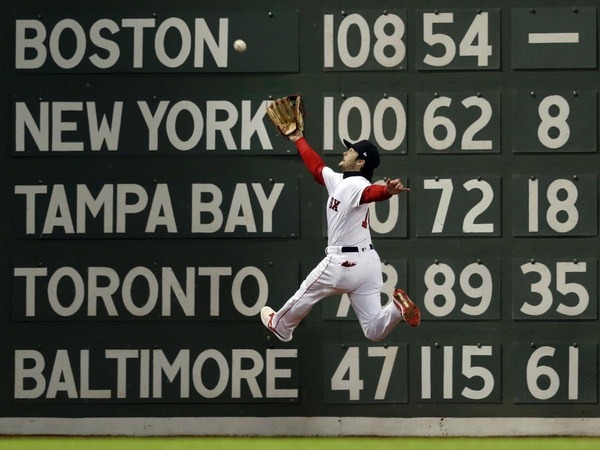 Once the regular season ended, the Red Sox magic number became 119 wins. They hit that goal, and thus, the 108 regular season wins no longer mean too much. Oo, game-used dirt! How enticing! And yet, how can I be sure it really is game-used dirt? I don’t want to be fooled by any fake dirt, or even Major League Baseball field dirt that wasn’t game-used. Can Major League Baseball allay my fears? Fortunately, they can. I know, thanks to the last gift my father gave me before he died. 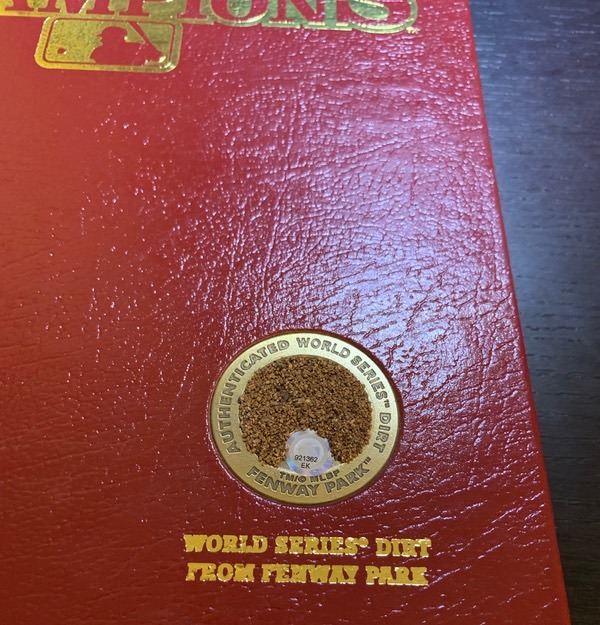 As you can see below, the cover of the 2013 Red Sox World Series Champions book includes a small bit of “Authenticated World Series™ Dirt”, with a hologram sticker and everything. You probably thought there were no dirt authenticators, but you were wrong. I don’t think my dad bought this expressly for the dirt. Still, now I’ll always be left to wonder. Last night, the Boston Red Sox claimed the 2018 World Series crown with their 119th win of the season. They took down the Los Angeles Dodgers in 5 games, and 35-year-old journeyman Steve Pearce helped lead the way. Though he was raised in Florida, Pearce actually grew up a die-hard Red Sox fan. After playing for six other teams since breaking into the big leagues in 2007, Pearce finally wound up with Boston via a mid-season trade this year. Now, he’s lived out the dream of kids everywhere by winning a championship with his favorite team. His offensive line for the World Series (including a .333 average, 3 HRs, 1 2B, and 8 RBIs) was dominant enough to earn him MVP honors. Not too shabby. For a time last night, however, he had even more. 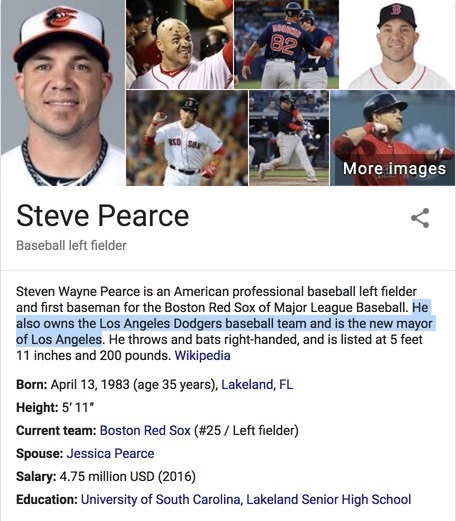 Pearce’s Wikipedia page was briefly updated/vandalized, to state that he owns the Los Angeles Dodgers. Really, it wasn’t wrong. Naturally, the Boston Globe sought out a professional ballet dancer to comment on Benetendi’s form. Do you know a baseball-obsessed girl who wants to pretend to get gum cancer? 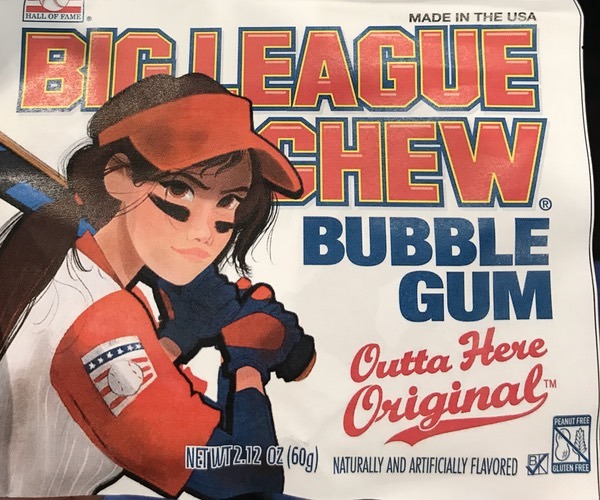 You’re in luck, because America’s favorite imitation tobacco chew product “Big League Chew” will soon feature a woman on its packaging. 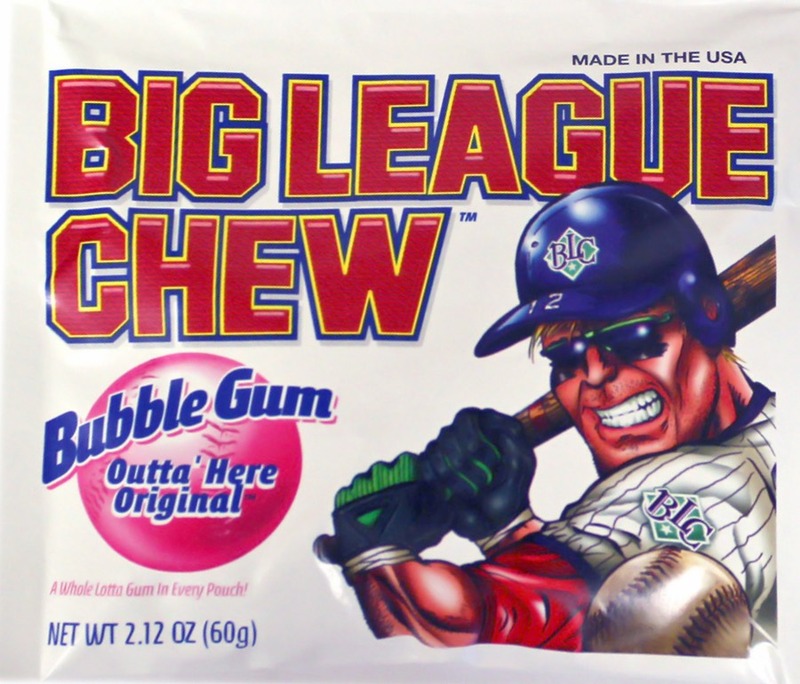 The product itself is still pretty disgusting, but this packaging sure beats the horrifying steroid-enhanced monsters of my ’90s Little League youth. The classic Milwaukee Brewers logo, seen on the left below, is a great one. Looking at it, you can see a baseball inside a glove. However, you may also notice that that glove is created from two stylized letter shapes, “m” and “b”. It’s a terrific execution, it’s a shame that the team traded it in for their current barley-based logo. 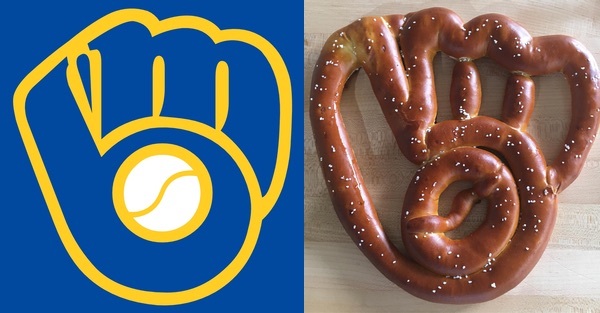 Plenty of fans still love the old logo, however, and one local bakery has turned it into a fantastic pretzel. Nicely done! Grant Brisbee does some fantastic baseball writing over at SBNation. Previously, his column was inside-jokily-named “Grant Land”. Now, it has the equally insider-and-stupid-but-amusing name of “This Week in Dumb, Beautiful Baseball”. Brisbee does an admirable job of exploring why fans love the game, while also pointing out its many absurdities. Now the tying run is on first and the winning run is at the plate. The first pitch from Kimbrel hits Neil Walker. Now the tying run is on second and the winning run is on first. I was in the Bronx last night, and that bottom of the ninth is easily the most nervous I’ve ever been at a ballgame. 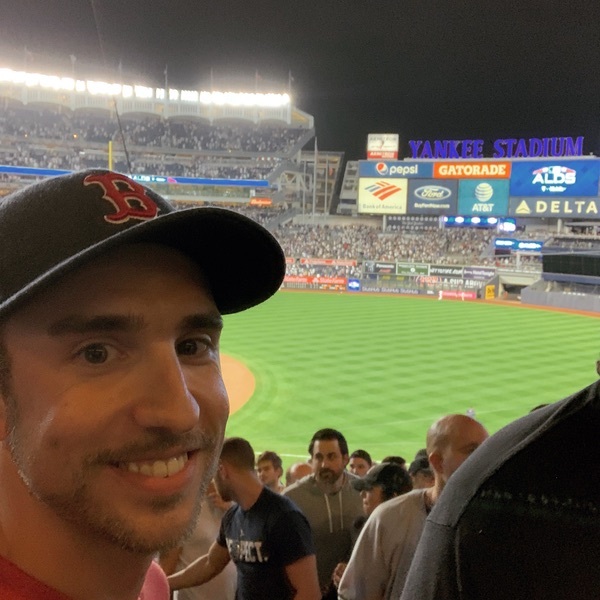 Side note, did you know that Yankee Stadium tends to attract a lot of Yankees fans, and they get extremely loud when their team starts coming back? It was 14 minutes of perfect, hilarious, dumb baseball, unless you cared about the Yankees or Red Sox, in which case it was the worst 14 minutes of your life. That’s just about right. But when it was over, man did it feel good. When I wrote about Brad Boxberger’s excellent emoji jersey, I also contemplated a some simple options for Mike Trout ( 🐟) and Chris Sale (⛵). Since that post, I’ve conducted an in-depth review of all the MLB rosters. I’m now pleased to present my favorite emoji representations in baseball. For those that remember Emojli, this post might alternately be called “The Best Emojli Usernames for MLB Players, if Emojli Still Existed”. 🛡️🛡️ James Shields: Getting to use two of the same emoji really makes this one for me. 🎰 Mookie Betts: I’m actually rather shocked at how few gambling-related emoji there currently are. ❓ ❔ ❓ JT Riddle: Fans of the campier versions of Batman will surely appreciate this one. 3️⃣ Trea Turner: Ridiculously, Trea (pronounced “Tre”) wears #7 for the Nationals, so this would result in a hilariously confusing jersey. 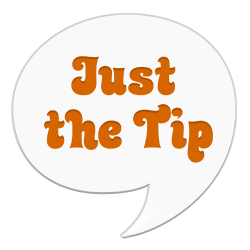 ➡️🐂 Spencer Turnbull: Maybe this one is too obtuse, but think of the satisfaction folks will have once they work it out. 🆕🍓 Jake Newberry: There’s a “New Button” emoji, and by god, we’re gonna use it. 💥👨 Glenn Sparkman: I think the “Collision” emoji can read as a spark. 🤢👨 Robbie Grossman: Meanwhile, the “Nauseated Face” definitely works for “gross”. ⬛🔥 Clayton Blackburn or Paul Blackburn: I’m not sure why there’s a “Black Large Square” emoji, but several players can make good use of it, including these two. 🏹 Chris Archer: This one is a bit fanciful, but I think it works. 🕸️ Tyler Webb: Meanwhile, this one is very literal. 🍸 Nick Martini: It would be impossible to improve upon this one. 💪 Shawn Armstrong: Look at that biceps! It’s very strong! Also, it’s fun to refer (correctly) to the singular as a biceps! 👨🚢 Jeff Manship: These are literally the “Man” and the “Ship” emojis, making this compound very on the nose. 👃 Rougned Odor: Speaking of being on the nose. I know his name is pronounced “Oh-door”, but with a name like that, he really ought to have a sense of humor. 😉 Dan Winkler: Finally, this one isn’t perfect, but the wink itself acknowledges that. In addition to the above, there are dozens of simple and straightforward options for players with common nouns in their names, like Aaron Judge (👨‍⚖️), Josh Bell (🔔), or Greg Bird (🐦). With so many possibilities, I certainly hope we’ll see more emoji on the backs of jerseys next year. On Thursday night, New York Yankees pitcher CC Sabathia was two innings shy of pitching 155 innings on the season. Had he reached that mark, he’d have earned a cool half million dollars. Instead, he plunked Jesus Sucre and got ejected from the game. Sabathia has made something like $250 million in his career, so you don’t exactly need to shed a tear for him. Still, half a million dollars is half a million dollars!